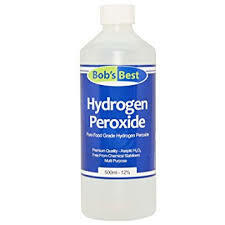 Hydrogen peroxide is an easily available household disinfectant and bleaching agent. The Top 5 uses of Diluted hydrogen peroxide in garden, mainly because of its antimicrobial and oxygen releasing properties coming up. . Hydrogen peroxide is a colorless liquid with chemical formula H2O2 similar to water, with just an extra oxygen atom, but it is a combustible and corrosive substance, especially at higher concentrations. 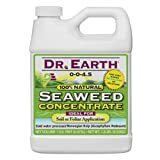 Although it is inorganic, that is a chemical, but it easily decomposes to water and oxygen, and hence safe to be used even in organic gardening. Now the top 5 uses of hydrogen peroxide in gardening. 1. Disinfecting Garden pots and tools specially the cutter or pruner in cloning process: For this you can use 6% h2o2 solution to wipe off the cutting tool with a cotton soaked in hydrogen peroxide or dip the tool into the solution. This increases the chances of a high success rate in growing plants from cuttings, because you are not introducing pathogens into the plants from cutting tools. 2. Disinfect Germination Trays and Potting Mix: for a high success rate in germination. Add 3% h2o2 solution to the seed starting or potting soil and leave it over night before using the soil for seed sowing. The germination trays can also be wiped with 6% solution. 3. Accelerate Germination Time and Root Development: Seeds soaked in diluted hydrogen peroxide germinate faster and display healthy growth. This is because of the oxygen released when hydrogen peroxide breaks down. Since oxygen requirement of sprouting seeds is very high, this extra oxygen supply is obviously beneficial. So best is to mix 1 to 3 % solution in soil or simply water the seeds with the solution. This also helps in root development. 4. Control Bacterial and Fungal Root or Stem Rots: Spray a diluted solution of 1 to 3 % depending on the severity of the disease. Do not use high concentrations, as this may burn the plant. 5. Weed Killer: At 10% concentration and above it completely destroys all types of vegetation it comes in contact with. So, use it with caution around your plants. One Warning: If it accidentally splashes on your hands or gets into your eyes, flush immediately with lots of cold water. So, there we have it folks. That was our episode on the top 5 benefits of hydrogen peroxide in garden. You probably have at least one box of baking soda in your home. If you’re like so many other Americans, it’s most likely sitting in your refrigerator as a way to combat odors, and you might have another carton in your pantry for baking. But there are so many other uses for it, from household cleaning and health to gardening, you might want to go out and purchase at least a couple more. Here is what baking soda can do to your garden. Get more beautiful blooms. For flowers that thrive in alkaline soil, such as hydrangeas, begonias, and geraniums, you can encourage them to bloom magnificently by using baking soda. Just dissolve a little baking soda in your water before giving them their regular drink. Also to keep your cut flowers fresh for a long time put a teaspoon of baking soda in the vase. Sweeter Tomatoes. Sprinkle a small amount of baking soda around the base of your tomato plants. The baking soda will be absorbed into the soil and lowers the acidity level of tomatoes, thus gives you sweeter than tart flavor. Give Plants a Boost. Mix together 1 teaspoon baking soda, 1/2 teaspoon clear ammonia and 1 teaspoon Epsom salt in a gallon of water. Mix well and give each plant about a quart of the solution. This solution will work as a fertilizer, the plants that are looking dull, and growing slowly will perk up, rejuvenate their growth and become lush green. Use it as a Pesticide. Use baking soda to effectively reduce infestations of many insects such as aphids, scales, and the spider mites. It may not kill them all but have a repellent action and halt their progress. Mix 1 teaspoon of baking soda and 1/3 cup of olive or mustard oil. Measure out 2 teaspoons of this mix and add it to 1 cup of water. Mix it well together and spray it on the infected plants. Smelly compost. To keep the smell from a compost pile under control, use a small amount of baking soda which will eliminate the odor and prevent acidity build upjust use it sparingly as too much can slow the composting process. Kill crabgrass and discourage weeds. If you have weeds or crabgrass growing in cracks on sidewalks, edges, patios or garden beds, you can use baking soda to get rid of them. It’s able to kill small weeds that have already sprouted, as well as to prevent new weeds from coming up. It will burn unwanted foliage, and feeds should disappear within just a few days. Just pour a thick layer onto the weeds and crabgrass after moistening it with water. Sweep the baking soda in a thick layer into any concrete cracks. Test Soil pH. Take some soil on a dish and make it muddier. Sprinkle a small amount of baking soda onto the soil. If the combination bubbles, your soil is acidic. Epsom salt is a natural mineral that was first discovered in Epsom, England. People typically use Epsom salt in the bathroom to relieve aches and pains or internally as a laxative, but it is also a garden additive that expert gardeners swear by. It can help you produce lush, healthy plants, flowers and trees. Here Are 7-Amazing Reasons to use Epsom salt in your garden. Epsom salt, when added to trees, bushes and vines that produce fruit, boosts the chlorophyll inside the plant. When plants have more chlorophyll, they have more energy, when they have more energy, they produce more sugar. More sugar means sweeter fruit for you to enjoy. Tree stump removal can be costly, but if you don't have the money to get a stump removed, let Epsom salt come to your rescue. Simply drill few holes into the stump and fill in the holes with Epsom-salt. In weeks, the stump will begin rotting. Many commercial fertilizers add magnesium to help plant roots take up vital nutrients (nitrogen, phosphorus, sulfur. )For those using all organic materials to feed their gardens, adding Epsom-salt to soil will improve absorption naturally, eliminating the need for processed chemical-fertilizers. If your lawn isn't lush and beautiful, it probably needs a little magnesium in its life. To perk-up grass, add 3 pounds of Epsom salt to every 1,250 square feet of grass and then water your-lawn. Ever wonder why your neighbor’s rose bushes are fuller than yours and sport so many more blossoms? It is highly likely that the answer is Epsom salt. Epsom salt to rose bushes encourages them to produce larger flowers with darker, deeper colors. To incorporate Epsom salt to your rose bush's diet, add it at the time of planting and when flowers are in bloom. Plants that aren’t getting enough magnesium can be identified by their yellowing leaves. This is because magnesium is an essential component in the production of chlorophyll. Try sprinkling Epsom salt around your plants to achieve healthier foliage. About 1-tablespoon per 12-inches of height once a month will benefit the plants in your vegetable-garden, as well as any trees, shrubs, flowers and grasses you want to green-up. Many people enjoy growing plants from the nightshade family such as peppers, tomatoes, eggplants and potatoes. All nightshades need a lot of magnesium, so that they produce greater yields. Epsom salt also helps improve the flavor of nightshades. To ensure the nightshades you grow in your home garden are abundant and tasty. add 1-tablespoon of Epsom salt to your peppers and tomatoes by sprinkling it around the base of the plant. If you want the salt to dissolve more-quickly, add it to a gallon of water and water the plants with the mixture. You should continue to add the Epsom-salt to your plants every 2-weeks. Nova Green 22-0-16 Fertilizer - Hydroponic, Soil and Foliar Feed - 1qt. Did you know that Milk can be good for your garden and use of milk in gardening can work as a fertilizer and help get rid of plant diseases like powdery mildew and viruses. To know more about this and the exact recipe to use in gardening, Stay tuned. Firstly, we shall talk about the benefits of milk in gardening and then in the end about the recipe and how to use it on your plants. 1. Firstly, its use as a FERTILIZER. Milk contains calcium, beneficial proteins, vitamin B and sugars that are good for plants, improving their overall health and crop yields. 2. Used as a quick remedy for Blossom End Rot (BER) commonly seen in tomato and pepper and spraying milk on the plant leaves helps a lot. that's called foliar feeding. This Blossom end rot is due to lack of calcium either in the soil or a defect in the plant system to uptake calcium from soil. 3. Milk has been used as an effective antifungal agent, specially in the prevention of powdery mildew. 4. Milk has been used in pesticide applications, especially for aphids. And also milk has been effective in reducing the transmission of mosaic leaf viruses such as tobacco mosaic. There are certain drawbacks of using milk in garden, like:1. Excessive use of milk can help harmful bacteria to multiply and spoil the plant producing a foul odor and then poor plant growth. 2. Rarely it can induce plant rot and some leaf spots if used inadvertently. But, whatever, the benefits are a good thing for us in gardening. So lets learn how to correctly use the milk in garden. It's a simple formula. Just two points on this:- If it's skim milk, you can pour or spray it directly onto your plant's leaves - this is called foliar feeding. The leaves will absorb the milk solution. - Secondly to be on the safer side, use 50 percent Milk + 50% Water and spray on the plants foliage. Now the question is How often you can do this. The answer is use of milk monthly once is recommended. And for plants already suffering from blossom end rot problem, along with this quick remedy, you can also use calcium nitrate spray, egg shell powder in soil, bone meal powder and also garden lime in soil. -- Thirdly, one Gardening Hack to use this milk solution : You can pour the milk solution around the base of the plants where the roots will gradually absorb the milk especially for smaller gardens. The gardening hack here is: Place the top portion of a 1 or 2-liter bottle containing milk solution (upside down) in the soil next to the plant. This makes an excellent hack to offer both water and milk feed to your plants. Lastly 2 more Tips: - 1. When you are finished with your milk container, before you wash it out, fill it with water and shake it and water your plants- 2. Do not spray any form of chemical pesticide or chemical fertilizer after applying milk fertilizer. This can affect the useful ingredients in milk that actually help the plants, that's the commensal bacteria. The medicine Aspirin, once used to be the most commonly used Non-steroidal Anti-inflammatory and Analgesic. Now surprisingly has found to benefit your garden. The Top 5 useful effects of Aspirin in gardening coming up. Aspirin is chemically Acetyl Salicylic Acids and salicylic acid is naturally found in willow bark and many other trees. So, what is the actual concept behind using Aspirin in gardening or farming. Studies have found that the plant hormone salicylic acid is released in tiny amounts when plants are in stress. So this concept has been utilized and many benefits of Aspirin have been proven, which I am going to list out one by one. 1. Aspirin as a Rooting Chemical: Rooting hormones like indole acetic and butyric acid are already discussed in my video on rooting hormones. You can check out that video. Well to improve the success rate of rooting while propagating from cuttings, simply take a teaspoon of cinnamon powder from your kitchen and add it to 1 liter of lukewarm water and then drop in half a 350mg dispersible aspirin tablet and stir it well. Then dip the cuttings into this solutions for about 30 to 60 minutes and then plant those cuttings. 2. Aspirin Improves Seed Germination: A low dose of aspirin water significantly improves seed germination and in one study the plants treated with the aspirin water had a 100 percent germination rate, while the plants that weren't treated had more inconsistent results. For this drop half a tablet of a 350 mg Aspirin into 1 liter of water and stir well and spray on the sown seeds or soak the seeds in it for few hours before planting them. 3. Aspirin for Plant growth: The University of Rhode Island sprayed plants with an aspirin water solution once every three weeks for the course of an entire growing season. At the end, the plants sprayed with the aspirin solution were found much bigger and had more fruit or flowers than their counterparts. 4. To keep Cut flowers stay fresh: Put a half a tablet of aspirin in a vase with fresh cut flowers from your garden to help them stay fresh longer. 5. Aspiring for Healthy Tomatoes: Spray your tomato saplings or even soak the tomato seedswith the same mixture of water and aspirin, before planting them in the ground for healthier,more disease resistant plants. 6. Aspirin spray also an anti fungal and treats Blight in plants: Blight refers to a specific symptom affecting some plants like tomatoes due to infections by pathogenic micro organisms, leading to rapid and complete chlorosis, browning, then death of plant tissues such as leaves, branches, flowers and fruits. Now Coming to some Possible Side Effects of Using Aspiring in Garden if used improperly:- Plants may develop brown spots and appear to have burnt foliage. The best way to protect against this is to spray early in the morning just before sunrise and not under direct hot sun. - Also keep watching plants for their response to the treatment. Not all plants may be suitable for the aspirin regimen, but it has been shown that eggplants, peppers, tomatoes, and potatoes benefit the most. . One last reminder is, technically, using aspirin is not an organic solution, however, it is a safe and very inexpensive option that contains far fewer chemicals than the store-bought chemical products. Please try these in your garden and provide your feedback in the comments section below. Happy Gardening!